Trade unions are organisations representing the interests of workers. They were formed to counter-balance the monopsony power of employers and seek higher wages, better working conditions and a fairer share of the company's profits. Critics of trade unions argue they can be disruptive to firms, discouraging investment and improved working practices. Furthermore, powerful unions can lead to macroeconomic problems such as wage inflation and lost productivity due to strike action. When Mrs Thatcher came to power in 1979, her stated aim was to reduce the power of unions. She felt that unions were a major contributor to the declining competitiveness of the UK economy. To a large extent, Mrs Thatcher was successful in reducing the power of unions. However, in recent years, an increasingly non-unionised workforce has seen a growth in flexible hours, job insecurity and poor wage growth, suggesting workers have lost out from the decline of trade union power. Industries with trade unions tend to have higher wages than non-unionised industries. Trade unions can pursue collective bargaining giving workers a greater influence in negotiating a fairer pay settlement. The efficiency wage theory states that higher wages can also lead to improved productivity. If workers feel they are getting a higher wage, they can feel more loyalty towards the firm and seek to work for its success. In many industries, firms have a degree of monopsony power. This means firms have market power in employing workers. It enables firms to pay wages below a competitive equilibrium (W2) and also employ fewer workers at Q2. There are many cases of powerful firms making a very high level of profit, but paying relatively low wages. If firms have monopsony power, then a trade union can increase wages without causing unemployment. Even if a trade union successfully bargained for a wage of W3 - employment stays the same as Q2. If a trade union bargains for W3, it does not create unemployment, but employment stays at Q2. In the face of Monopsony employers, Trades Unions can increase wages and increase employment. Traditionally, monopsonies occur when there is only firm in a town or type of employment. However, in modern economies, many employers have a degree of monopsony power - related to difficulties of moving between jobs. Trades Unions can also protect workers from exploitation, and help to uphold health and safety legislation. Trades unions can give representation to workers facing legal action or unfair dismissal. Trades unions can help to negotiate and implement new working practices which help to increase productivity. For example, in wage negotiations, firms may agree to increase pay, on the condition of implementing new practices, which lead to higher productivity. If the trade union is on board, then they can help create good working relationships between the owners and workers. Modern labour markets are increasingly flexible with weaker trade unions. These new developments in labour markets have led to a rise in job insecurity, low-wage growth and the rise of zero-hour contracts. Non-unionised labour helps firms be more profitable, but wages as a share of GDP has declined since 2007. Unions could help redress the monopoly power of modern multinationals. 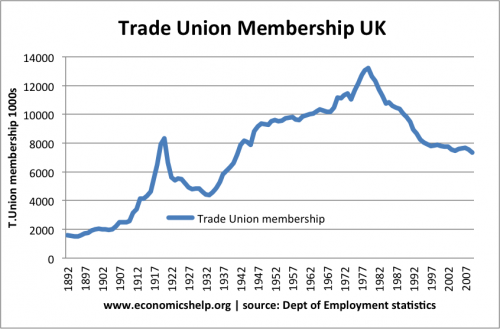 From the late 1890s to 1980s, the UK saw a growth in trade union membership. 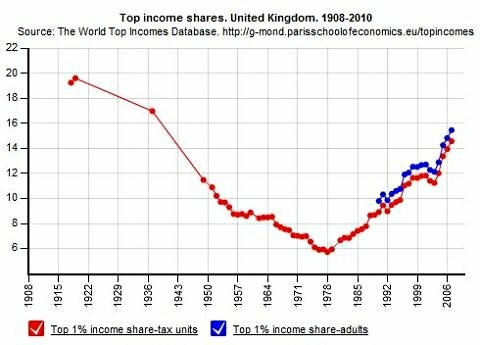 This was also a period of falling inequality and a reduction in relative poverty. Since trade union membership peaked in the early 1980s, this trend of reduced inequality has been reversed and inequality has increased. If labour markets are competitive, and trade unions are successful in pushing for higher wages, it can cause disequilibrium unemployment (real wage unemployment of Q3-Q2). Union members can benefit from higher wages, but outside the union, there will be higher unemployment. It is also argued that if unions are very powerful and disruptive, it can discourage firms from investing and creating employment in the jobs. If firms fear frequent strikes and a non-cooperative union, they may prefer to invest in another country with better labour relations. For example, in the 1970s, the UK experienced widespread industrial unrest and this is cited as a factor behind the UK's relative decline. Trades unions only consider the needs of its members, they often ignore the plight of those excluded from the labour markets, e.g. the unemployed. If unions go on strike and work unproductively (work to rule) it can lead to lost sales and output. Therefore their company may go out of business and be unable to employ workers at all. In many industries, trade unions have created a situation of a confrontational approach. 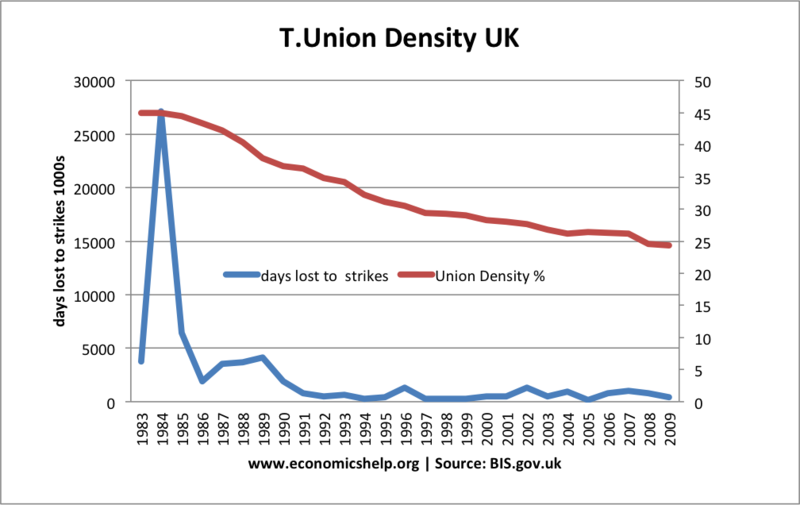 Decline in trade union density has led to a decline in days lost to strikes. If unions become too powerful they can bargain for higher wages above the rate of inflation. If this occurs it may contribute to wage-inflation. 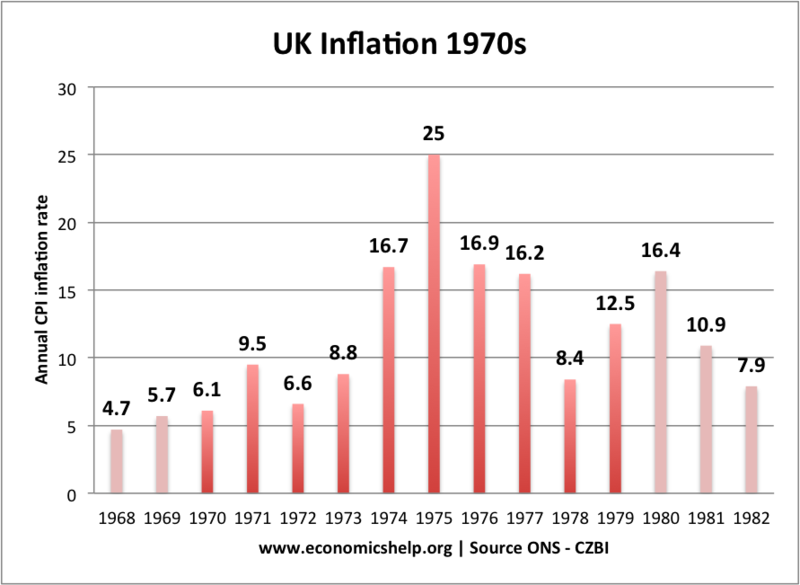 Powerful trades unions were a significant cause of the UK's inflation rate of 25% in 1975.
hi i used this site resently and it helped so i thought i should say thanks. helped me finish my project:) thanks so much! thanks so much, its the first site that has been able to help with information on unions and their advantages and disadvantages. :D:D you've helped me alot ! thanks this was of great help to me i actually doubted this page but it gave me an A+ for my P.O.B assignment. Cool story bro, changed my life! this is great, but, uh, what's a monopsony? Is it the same thing as a monopoly? this has helped me finish my project. its the first site to actually have usefull points on the advantages and disasvantages of unions. Hi, taking 1975 as an example - which pay-deals across unionised industries matched CPI inflation? My understanding was that during the miners strike a deal was struck at approx 12% increase, which was still below inflation on average in the preceding decade? I may be wrong and please correct me if this is so.